Often thought of as “adult acne,” rosacea is a very common condition in adults, usually involving the central portion of the face. 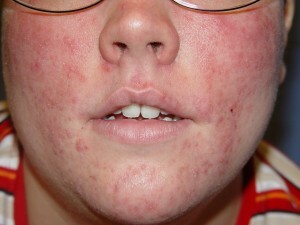 There are several different types of rosacea. In one form, patients have increased redness and small “broken capillaries” on the central face, with a tendency towards flushing and blushing, sometimes in response to triggers. Common triggers include alcohol, spicy foods, caffeine, heat, wind, cold, and others. Sometimes there are also small red bumps and pus bumps, much like acne vulgaris or common teenage acne. There may also be redness of the eyes or eyelids, or a feeling of dry, “gritty” eyes. In rarer cases the skin may get thicker and bumpier over time. Additionally, rosacea may come to involve more extensive areas, such as the hairline, neck and chest. There are many treatments for rosacea but, like many common dermatoses, no cure yet. Your doctor may wish to treat you with creams, washes or pills, depending on your skin type, the type of rosacea that you have, and your other medical issues.